Blink - The Chip's Challenge Wiki - The Chip's Challenge Database that anyone can edit! 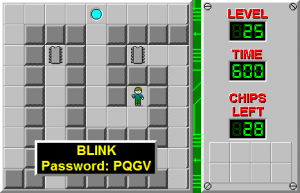 Blink is the 25th level in Chip's Challenge 1. 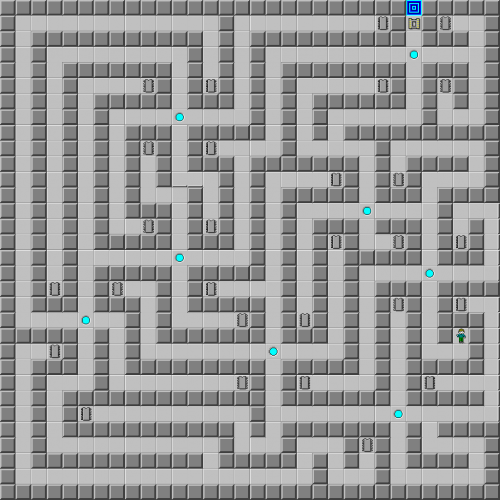 It's a simply designed level, with several teleports leading to different locations, but it can be difficult if the player fails to pay attention. The key to Blink are the few stations where Chip can move between horizontal and vertical teleportation; one is in the southeast, one in the middle, and one close to the left side. There are only eight teleports, so it's not difficult to figure out how to get to a specific location assuming Chip knows where that location is. When walking around, Chip can see corridors leading to some chips that have not yet been collected. Slide U, D, U, DU, and D, then take the chip to the left, slide U and take the chip on top, and you are now at a switch station. Turn right with RL, R (take both chips), LR, L, R, LR, D, U, D, and UD, where you can collect the two chips to the right or leave them for later. Switch directions and continue to slide L, R, L, R, L, R, LR back to the station again, and now collect the two chips if they haven't been already. The last few moves are U for two chips, D for 2 chips, and with all the chips collected, the exit is UDUDU away. Because Chip's Challenge has specific glitches in dealing with mouse use to go through teleports (see Teleport Skip Glitch for an example), using the mouse alone on Blink makes it a tremendously difficult and tedious task.